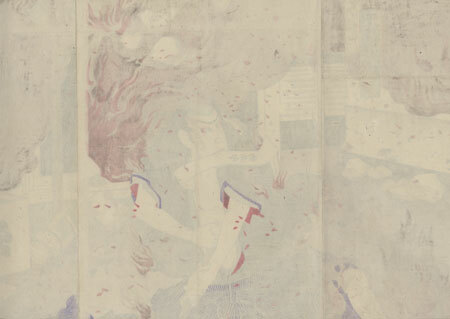 Comments - Fantastic kabuki scene of Ichikawa Sadanji I as the young samurai Okawa Tomoemon rescuing important documents from the burning palace of his daimyo, Lord Hosokawa. The loyal Okawa rushed back into the flames to retrieve the documents, only to discover that escape was impossible. To save the papers, he committed suicide by disemboweling himself, thrusting the documents into his belly in the hope that his body would prevent them from burning. After the fire, his charred body was recovered with the bloodstained papers intact, thus saving his master's fortunes. 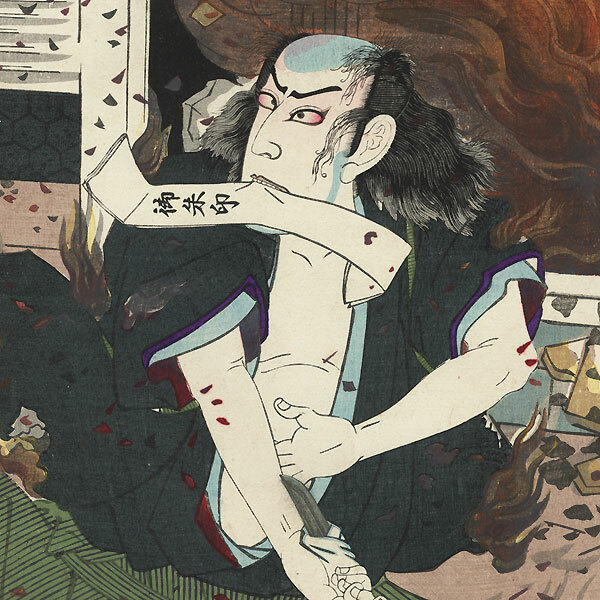 Here the samurai looks wildly around for escape, orange flames billowing and burning embers flying around him, the document caught between his teeth. He bares his chest with one hand as he prepares to plunge his sword into his belly, his robes already on fire. An incredible dramatic scene with a dynamic composition, beautifully printed. 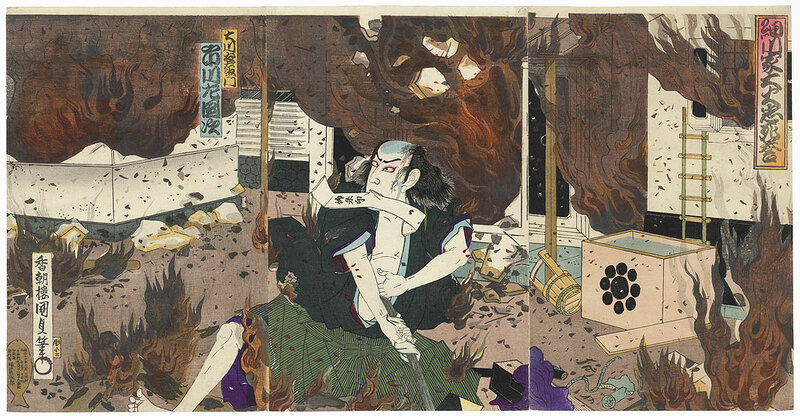 A terrific illustration of Tomoemon's heroic sacrifice and a great choice for a collector interested in classic Japanese tales. Condition - This print with excellent detail as shown. Three attached panels, backed with paper. Vertical fold, diagonal fold at edge. Slight soiling, a few creases. Please see photos for details. Good overall.